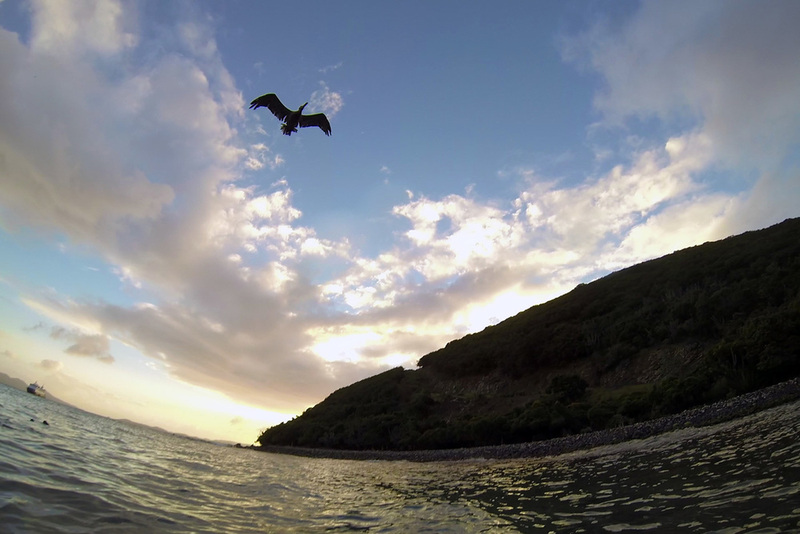 The GoPro is more than an underwater camera, but a conversation piece. Everyone who sees me carrying this funny little device with a waterproof handle asks "what's that?" The Green Sea Turtle can be found feeding in grassy areas on the sea. With this tiny device it's possible to record incredibly high resolution footage both on land and in the sea. Weighing less than a pound, it's incredibly easy to travel with. The Green Turtle ascends towards the surface to take a breath of air. The battery life is definitely quite limited with a full charge only providing about an hour of shooting time. Video of course is more demanding than stills, but I am surprised just how fast it drains even with Wifi turned off. My system of multiple batteries and a wall charger has worked out really well. Before every use it's necessary to put a fresh battery in. On top is the Common Sea Fan, with the yellow Grooved Brain Coral on the right side of the image. As for the memory, I'm using two Kingston cards and haven't had any issues with freezing or crashing. Two 32GB cards offered a little more than 4 hours of footage. After 13 days I'm down to my last 21 minutes of space. This is called Club Finger Coral, known for its blunt, swollen tips. For stills, the camera is extremely wide, almost fisheye. It is possible to straighten curved horizons in Lightroom rather easily, but in some cases, I think the effect will actually be nice. Perhaps the best part of the camera is its ability to go anywhere. These types of shots enable richer storytelling with unique moments that would not have otherwise been possible. Elkhorn Coral resembles the antlers of a Deer, Moose, or Elk. This little camera was not a huge investment with the device and all necessary accessories running around $500. In return, I was able to witness and capture a part of the world I've never seen before. Beware, the Long-Spined Sear Urchin can cause serious pain if stepped on. 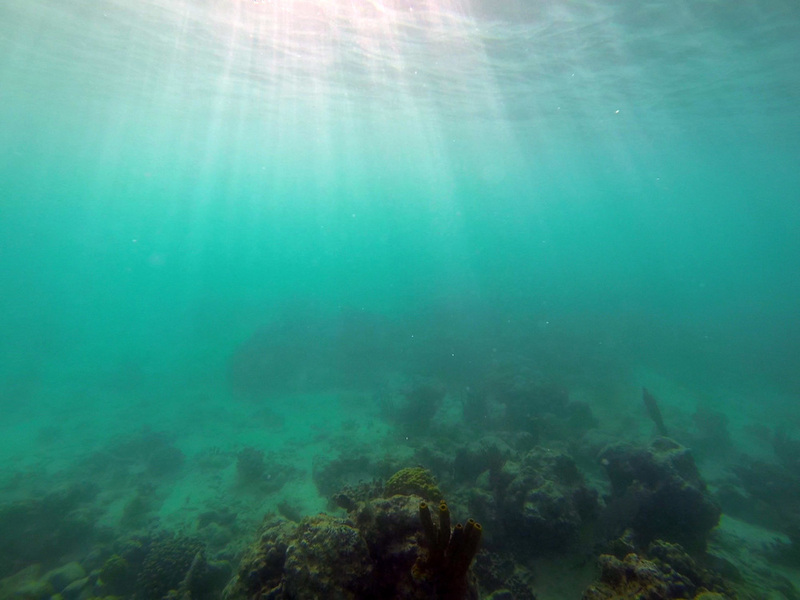 Without an LCD screen to distract from the experience, I really felt connected to the diverse beauty of life underwater, watching with my eyes, and just letting the video roll. The floating handle actually helped to stabilize things a great deal as opposed to handling the tiny device on its own. Overall, I'm quite satisfied with the quality of the images. It is important to be aware of the light you are working in and the camera's limitations. For the best results, I tried to stay within the first five feet of water. Any deeper and the ocean was darker with murkier footage. I paid very close attention to the areas where the sun was illuminating the ocean floor as this often held a preferable level of contrast. My setup was simple with no color correction filters or lens attachments.